The mechanisms of exercise-induced fatigue have not been investigated using proteomic techniques, an approach that could improve our understanding and generate novel information regarding the effects of exercise. In this study, the proteom alterations of rat skeletal muscle were investigated during exercise-induced fatigue. The proteins were extracted from the skeletal muscle of SD rat thigh, and then analyzed by two-dimensional electrophoresis and PDQuest software. Compared to control samples, 10 significantly altered proteins were found in exercise samples, two of them were upregulated and eight of them were downregulated. These proteins were identified by MALDI TOF-MS. The two upregulated proteins were identified as MLC1 and myosin L2 (DTNB) regulatory light-chain precursors. The eight decreased proteins are Glyceraldehyde-3-phosphate Dehydrogenas (GAPDH); Beta enolase; Creatine kinase M chain (M-CK); ATP-AMP Transphosphorylase (AK1); myosin heavy chain (MHC); actin; Troponin I, fast-skeletal muscle (Troponin I fast-twitch isoform), fsTnI; Troponin T, fast-skeletal muscle isoforms (TnTF). In these proteins, four of the eight decreased proteins are related directly or indirectly to exercise induced fatigue. The other proteins represent diverse sets of proteins including enzymyes related to energy metabolism, skeletal muscle fabric protein and protein with unknown functions. They did not exhibit evident relationship with exercise-induced fatigue. Whereas the two identified increased proteins exhibit evident relationship with fatigue. These findings will help in understanding the mechanisms involved in exercise-induced fatigue. Exercise-induced fatigue is a reduction in maximal voluntary muscle force that results from intense physical activity (Gandevia. S. C. 2001). Exercise-induced fatigue is a complex process. In the course of exercise the physiological environment changes, which could result in the alteration of gene and protein expression levels and the alteration of posttranslational modifications. Importantly, intense and prolonged exercise can result in changes in cell signaling pathways in eukaryotic cells (Reid MB. 2008; Powers SK et al. 2008). Thus, the proteome profile of skeletal muscles during exercise-induced fatigue is distinct from that of the normal physiological state. Although many proteins associated with exercise have been identified (Adam J et al. 2009; Borja Guerra et al, 2010; Craig A. Goodman et al. 2009), the molecular mechanisms involved in exercise-induced fatigue have not been well elucidated. Investigation into the alterations of proteins in exercise-induced fatigue will help to discover mechanisms, pathways and new players involved in the induction and regulation of fatigue. Proteomics is the study of protein properties (expression level, posttranslational modification, interactions, etc.) on a large scale to obtain a more global view of physiological processes. The application of proteomics to investigate exercise is in its infancy (D.S. Hittel et al. 2007), and few studies have been published in this area (Jatin G. Burniston 2008; Yamaguchi W et al. 2010). in order to understand the mechanisms of exercise-induced fatigue and search for new proteins involved in it. In the present study, an exercise-induced fatigue model of rat SD was built using swimming. Biochemical and behavioral indices were used to verify the credibility of the model. After the modeling, the skeletal muscle of rat SD thigh was separated at the low temperature condition and the proteins were extracted. 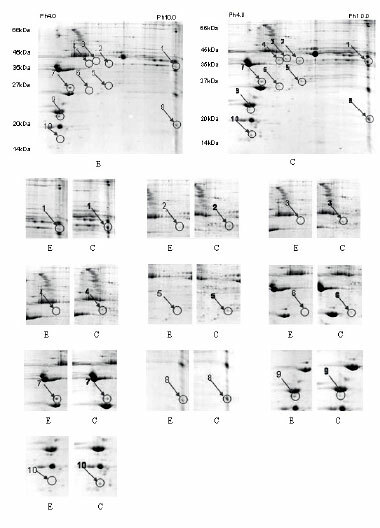 Proteins of skeletal muscle were separated by two-dimensional (2D) gel electrophoresis. The protein patterns of scanned 2D images were analyzed with PDQuest software and 10 proteins were found to be upregulated or downregulated. These altered proteins were then identified by MALDI TOF- MS/MS and searched against the SWISS-PROT and NCBInr database. Our findings reveal novel changes in the expression of well-known metabolic enzymes and myofibrillar proteins. Some of these are related to fatigue, while others have not been confirmed as involved in the process of fatigue. Therefore, further investigation of their roles during fatigue will help to elucidate the mechanism of exercise induced fatigue. The model of exercise-induced fatigue was established as described by (Shin Terada. 2001, HOU L. 2005). Nine- to ten-week-old male Sprague-Dawley rats with initial body weights of 200±20g were used for this study. Sixteen male SD rats were randomly divided into exercise and rest groups according to weight. In the exercise group, the rats repeated 30-minute swimming bouts daily for the first 2 days. This was increased by 30 min each day for the next 3 days, reaching 120 minutes of swimming by the fifth day. This was increased to 180 minutes for the sixth and seventh days. For the final three days the exercise was doubled by introduced 180-minute swimming bouts interspaced with six hours for rest. (Table 1). All rats swam in a barrel filled to a depth of 80cm and an average surface area of 190 cm2/rat. Water temperature was maintained at 35°C during swimming training. Changes in body weight and the biochemical index blood urea nitrogen (BUN) were used to verify the credibility of the model. 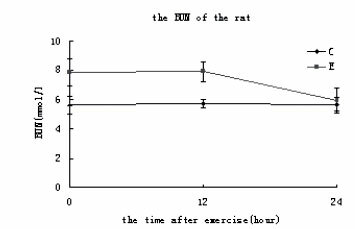 The rats from the exercise and control groups were killed by decollation, proteins were extracted from the skeletal muscle of SD rat thigh at a low temperature and dissolved in 9 mol/L urea, 2% CHAPS ( Sigma ), Pharmalyte pH 3-10 (Amersham Pharmacia), 1% DTT, and then separated from insoluble material by centrifugation. The total protein concentration was determined by the Bradford assay (Kruger N J et al. 1996). Two-dimensional gel electrophoresis (2DE) was carried out in the IPGphor system (BioRad) as described (Gorg et al. 1998). Isoelectric focusing (IEF) of 500μg samples was performed in pre-cast immobilized pH gradient (IPG) strips (pH3-10, L=18cm; Pharmacia) using the following rehydration and running conditions: rehydration 14hours, step 1: 250V, 30min, step 2: 1 000V, 1 hour, step3: 1 000-10 000V, 5-6hours , step 4: 10 000V, 60 000Vh. After IEF separation, the extruded strips were incubated in buffer 1 (50 mmol Tris-HCl, pH 8.18, 6 mol urea, 30 % glycerol, 2 % SDS, 015 %DTT) and buffer 2 (50 mmol/L Tris-HCl, pH 8.18, 6mol/L urea, 30% glycerol, 2% SDS, 4.5% iodoacetamide) for 15 min, respectively. The equilibrated gels were immediately applied to 12 % polyacrylamide slab gels for second separation. Gel electrophoresis was carried out at a constant current (30mA/ gel) and a set temperature of 20°C. Following electrophoresis, the gels were stained with Coomassie Brilliant Blue. Analysis of the gels, including background subtraction, spot detection, volume normalization and differences in protein expression levels among samples were analyzed by using PDQuest software (version 6.0, BioRad), To determine the variation, 3 gels were prepared for each sample. The protein spots that varied >2 fold changes and were specific for the test groups and the control group were manually labeled and considered for MS analysis. Gel spots were excised from the stained gel, and cut to 1-2mm2 slices. The excised pieces were destained with 25 mmol ammonium bicarbonate/50 % acetonitrile (Fisher), and were washed with 100% acetonitrile, and then dried with a SpeedVac Plus SC110A vacuum concentrator (Savant, Holbook, NY, USA). Trypsin in digestion buffer (25 mmol ammonium bicarbonate P5 mmolPL calcium chloride) was added to the dry gel pieces and incubated for 15 hours for rehydration at 37°C.The resulting peptide mixture was extracted with 5% TFA for 1 hour at 40°C and followed by 2.5% TFA/50% acetonitrile for 1 hour at 30°C. The supernatants were pooled and the peptides were dried by a vacuum concentrator. Peptide sequences were identified using matrix assisted laser desorption Pionization time of flight mass spectrometry (MALDI-TOF MS). Prior to mass spectrometry, the peptide samples were reconstituted with 0.5% TFA. Peptide mass mapping of tryptic digests was carried out with a Micromass Tof Spec MALDI-TOF mass spectrometer. The datasets of the MS spectra, including peptide sequence information, were searched against the SWISS-PROT (GeneBio, Geneva, Switzerland) and NCBInr database using Mascot Daemon (Matrix Science, London, UK) as a client attached to the Mascot search protocol. The proteins were extracted from the skeletal muscle of SD rat thigh and lysed in a buffer (0.5 M Tris HCl, 0.4% SDS, 20% glycerol, 1.5% BromphenolBlue, 1.0%beta-mercap toethanol) by boiling for 5min. Equal amounts of protein were subjected to 12% SDS gel electrophoresis and transferred to polyvinylidenediuoride membranes (AmershamBiosciences, Piscataway, NJ, USA). Membranes were probed with antibodies as indicated below and detected using ECL Advance or Plus (Amer-sham Biosciences). The blots were probed with the following antibodies, Rabbit anti-Actin (1:1000, cell signal), Rabbit anti-alpha Tubulin (1:1000), anti-rabbit HRP-conjugated secondary antibody (1:5000), and polyclonal anti-GAPDH antibody (1:500) (Santa Cruz, CA, USA). Protein expression data for control and treated groups are expressed as the mean±SD of 3 replicate gels for fold changes of normalized spot volumes. For the statistic analysis of data, the Student-t-test was used, with p<0.05 considered as significant. After ten days of loading-increasing swimming exercise, the body weight of the exercise group had decreased significantly and the BUN had increased significantly compared to the control groups (Fig 1, Fig 2). 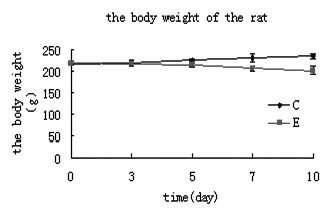 These changes of behavioral and biochemical index showed that the rats were in the condition of fatigue. The model was suitable for the use of the experiments about exercise-induced fatigue. To investigate the potential proteomic alterations of rat skeletal muscle during exercise-induced fatigue, the proteins were extracted from the skeletal muscle of SD rat thigh and separated by two dimensional gel electrophoresis, The muscles were stained with Coomassie Brilliant Blue and the data was analyzed by PDQuest software (Fig 3). Fig. 3: 2-D map of SD rat thigh (E: exercise group, C: controlgroups), number1 to number 10 indicate the up-regulated or down-regulated proteins in exercise group. Figure 3 shows a pair of Coomassie Brilliant Blue stained gels obtained from rat skeletal muscle proteins during exercise-induced fatigue. The distributing modes of overall skeletal muscle proteins were very similar to each other, the range of pI was 4.0-9.0, and the Mr range was 20-100 kD. The overall protein profiles in the control and exercise groups were compared by image analysis. Using pH 3-10 stripes, computer assisted analysis of the gels detected about 400 spots. Compared to control samples, ten proteins were apparently upregulated or downregulated in treated rats, determined by two dimensional gel electrophoresis and PDQuest software analysis. These proteins exhibited >2 fold changes between the exercise and control group. Two of them were upregulated and eight of them were down regulated. These proteins were identified by MALDI-TOF MS and the Mascot search program. Two of the upregulated proteins were identified as myosin L2 (DTNB) regulatory light chain precursor (pI 4.82, Mr 19kD), and Myosin light chain 1 (MLC1, pI 5.03, Mr 22kD). The eight downregulated proteins were identified as Beta enolase (pI 7.74, Mr 46.8 kD); Glyceraldehyde-3-phosphate Dehydrogenas (GAPDH, pI 8.44, Mr 35.8kD); Creatine kinase M chain (M-CK, pI 6.58, Mr 43kD); Adenylate kinase isoenzyme 1, ATP-AMP Transphosphorylase (AK1, pI 7.71, Mr 21.6 kD); Myokinase; myosin heavy chain (MHC, pI 5.31, Mr 24 kD); actin (pI 5.23, Mr 42 kD); Troponin I, fast skeletal muscle (fsTnI, Troponin I, fast-twitch isoform, pI 8.86, Mr 21.2 kD); Troponin T, fast skeletal muscle isoforms (TnTF, pI 6.18, Mr 30.6kD). The four downregulated proteins (GAPDH; Beta enolase; M-CK; ATP-AMP Transphosphorylase) are enzymes related to energy metabolism; the other four downregulated proteins, MHC; actin; fsTnI; TnTF) are muscle fabric proteins (Table 2, Table 3). Downregulation of actin and GAPDH expression was found in the muscles of the exercise group by 2-DE. Western blot analysis was then performed for these two proteins in an independent set of skeletal muscle samples. 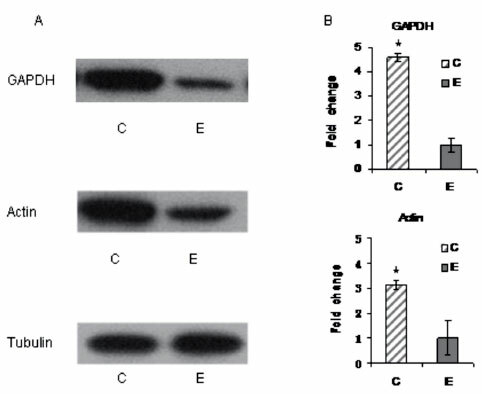 Western blot showed the consistent downregulation of actin and GAPDH in the exercise group compared to the control group, Levels of these two proteins were significantly lower in the muscle of the exercise sample compared to controls (Fig 4). Fig. 4: (A) Westem blost showing expression of GAPDH an actin among control and treated groups. Equal loading of the samples was evaluated by reprobingmthe membranes with tubuin antibody. (B) Quantitative fold change. * indicates significant differences, <0,05. During intense activation of skeletal muscle, contractile function becomes impaired. This is known as fatigue. The cause of fatigue is probably multifactorial, but a central role is changes in high-energy phosphates (i.e. ATP and ADP). The accumulation of by-products of rapid energy metabolism has also been postulated (Westerblad H et al. 1998). Therefore, the proteome profile of skeletal muscle during exercise-induced fatigue is distinct from that of the normal physiological state. In this study, the alterations of skeletal muscle proteins during exercise-induced fatigue were analyzed by two-dimensional electrophoresis. The results showed that 10 proteins were apparently upregulated or downregulated after exercise-induced fatigue. Two of them were upregulated and eight were downregulated. In these proteins, four of the eight decreased proteins may relate to exercise induced fatigue directly or indirectly. The other proteins represent diverse sets of proteins including enzyme related to energy metabolism, skeletal muscle protein that do not exhibit evident relationship with exercise.induced fatigue. Whereas, the two increased proteins that were identified exhibit evident relationships with fatigue. GAPDH is a classical glycolytic protein in energy production (Anders J et al, 2000). However, recent evidence has demonstrated that mammalian GAPGH displays a number of diverse activities unrelated to its glycolytic function. These include its role in membrane fusion, RNA transport, microtubule assembly, DNA replication, DNA repair, and apoptosis (Chuang DM et al. 2005). Exercise promotes consumption of energy sources such as glycogen by mobilizing internal energy metabolism to the maximum and using and depleting the energy source. The role of GAPDH in fatigue may correlate with its energy supply for movement and transport. Creatine kinase (CK) is a key enzyme for maintaining a constant ATP/ADP ratio during rapid energy turnover. It catalyzes phosphate exchange between the high free energy phosphates ATP and phosphocreatine (PCr) via the reaction: PCr + ADP + H+ ± creatine (Cr) + ATP. In skeletal muscle there are two major forms of CK: one is found in the cytosol (M-CK) and the other is associated with mitochondria (ScCKmit). M-CK dominates in fast-twitch muscles and is considered important for energy utilization at sites of high energy turnover (LaBella J J et al. 1998), Several studies have demonstrated that the complete absence of CK activity is associated with an immediate marked decline in skeletal muscle force generation and power output during repetitive activation (Steeghs K A et al.1997; Anders J et al. 2000; Watchko J F et al.1997; Momken I et al.2005), Our result is consistent with these previous findings. Beta enolase is a glycolytic enzyme of particular interest because it has muscle specific isoforms (Chosa E et al. 2003). In adults, subunits of the muscle isoform of enolase (b-enolase) accumulate preferentially in fast-twitch muscle fibers in which the b-isoenzyme accounts for more than 90% of total enolase. In this study, Beta enolase was found to have decreased in skeletal muscle. However, its role in fatigue remain unclear and deserves further investigation. Actin is a globular, roughly 42-kDa protein found in all eukaryotic cells. Actin participates in many important cellular processes including muscle contraction, cell motility, cell division and cytokinesis, vesicle and organelle movement, cell signaling, and the establishment and maintenance of cell junctions and cell shape. Myosin, a large family of motor proteins found in eukaryotic tissues, is a thick filament-based molecule that harnesses the free energy furnished by ATP hydrolysis to perform mechanical work against actin proteins of the thin filament. The cyclic attachment and detachment of myosin with actin that generates muscle force and shortening is Ca2+ regulated and is responsible for actin-based motility (Vandenboom R. 2004). MHC is a structurally bound contractile protein of the thick filaments, which has a ATPase function that could involve binding with actin. In this work, MHC and actin were found to have decreased in skeletal muscle. It is probable that during intense activation of skeletal muscle, contractile function becomes impaired, and attachment of myosin with actin, which generates muscle force, was no longer needed. In contrast to MHC, there are only three TnI isoforms, one for slow-twitch skeletal muscle, one for fast-twitch skeletal muscle, and one for myocardium (North KN et al. 2008). Our results provide evidence that the high muscle force associated with eccentric contraction causes rapid removal of fsTnI. These findings support the concept that eccentric exercise initiates a series of events that result in rapid disruption of the cytoskeletal network and contractile apparatus, which could be the mechanism for deterioration of the contractile response and loss in force generation. Skeletal muscle is the most important effector of exercise-induced fatigue, although several proteins have been found to be associated. However, their role in exercise-induced fatigue is not well understood. Therefore, further investigation of their role will help to elucidate the mechanism of exercise induced fatigue. # Note: Liping-zhao and Wenhui-Yan contributed equally to this paper.